For the quarter ended June 30th, 2016, KVF had a profit of $0.36 per share, increasing the value of each share to $20.15. These results are relatively in line with the returns produced by the S&P 500 and the Russell 2000 indexes, but were lower than the returns in the commodity-heavy S&P/TSX, which is still below its 2008 high. Once again the flattish quarterly return suggests it was a boring three months, but once again it was anything but. Some of KVF's positions fluctuated by more than 50% at certain times within the quarter, but by the end of the quarter these had either cancelled each other out or returned near enough to their previous prices. 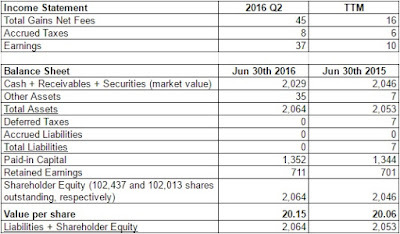 For the most part, KVF held onto or added to its losers on the quarter. Offsetting these losses was an enormous gain in the shares of Bracell (as discussed here), in which KVF no longer holds any shares. Late in the quarter, markets around the world went on a wild ride following the surprise results of the Brexit referendum. As a result, KVF applied some of the newfound cash from the Bracell sale towards buying a British company that appears to be very attractively priced following the market pounding it took. Currency losses played a minimal role in the quarter, reducing earnings by $0.04 per share. What is the new british company?